Quarrels center in a desire for recognition, honor, power, pleasure, money and superiority. It is a selfish act that DESTROYS children for life and leaves the possibility for a break-up. Arguing is narcissism. It is an exceptional interest and admiration for yourself. The single best measure of being emotionally healthy and being a grownup is the capacity for bilateral (2-sided) listening. There are two speakers and they both count. Instead of listening to your spouses point of view, your ANGER continues to get the better of you. You speak with resentment that you know you will regret later. Does your spouse’s concern count as much as YOUR concern counts? Only after you have heard the opposing side should you feel free to speak yourself. Even though this verse is difficult to heed to, this is VITAL for a healthy marriage. If so, what is your level of maturity? With one being low and ten being high, what level are you on? 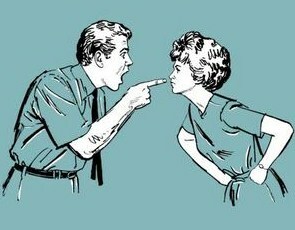 If you give your spouse a chance, it will lead to a much more constructive conversation. Before a marital confrontation, three things are REQUIRED to make it productive. Second is Compromise: You need a WIN-WIN situation. You both need to give in and you both need to get something. Third is Dialogue: He talks, you listen. She talks, you listen. This is saying that viciousness kills life. Do you want to KILL your marriage? Every time you argue and don’t show humility, or compromise and listening you have brought a breach into your marriage. Your words cannot be put back into your mouth. You have said enough things in your marriage that you wish you hadn’t. Do you want to add more? ?